This one is in the corner. 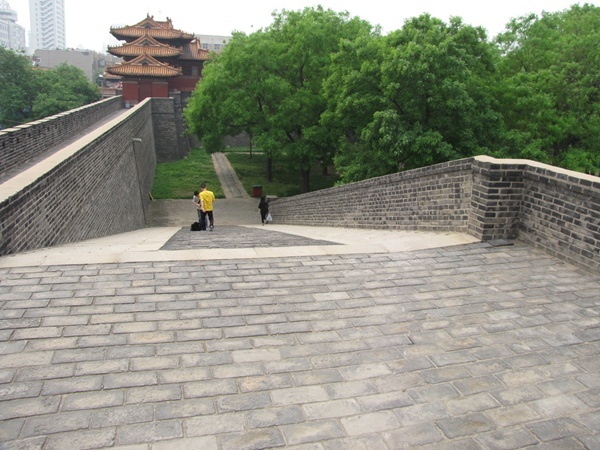 When we visited Beijing's Drum Tower, it is situated right on the meridian line. 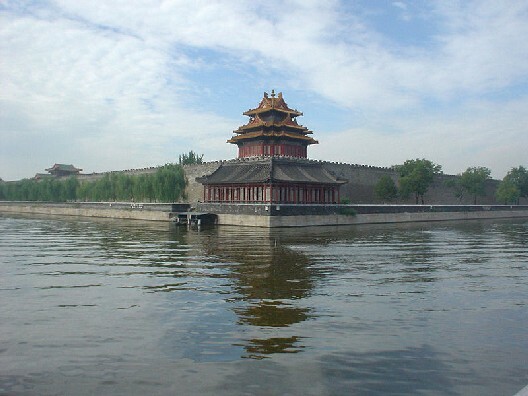 In fact the last Ming Emperor went to the drum tower and bowed to the North, where the ancestral Ming Tombs were located, before he committed suicide, as he was not able to continue. 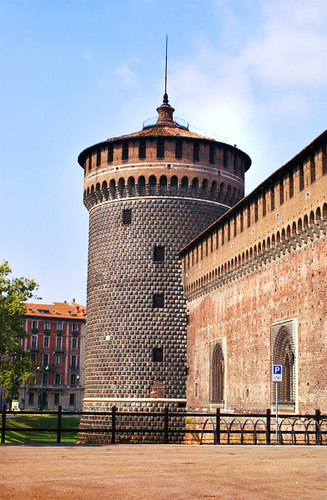 This purpose and function of a corner tower is to defend the city at the edges, and to look outward in the distance. Ming Dynasty Emperor Zhu Li dreamt of a defense tower with 9 roof beams, 18 posts, 72 ridges, and he ordered to complete this dream structure to be built in 9 days, else the workers would be beheaded. The artisan didn't know how to conceptualize this. At that moment, an old man bringing an intricately designed grasshopper cage was passing by. That cage happened to have exactly 9 roof beams, 18 posts, and 72 ridges. So based on that pattern, the artisan designed the corner turret. They believe the old man was master engineer Lu Ban who descended down from heaven to instruct the techniques. When Ming was destroyed by bandit Li Zecheng, but Turret building was left intact. The Tai Mountain Turret has been existence for more than 2000 years, as Qin Shihuang went to Tai Mountain to pay tribute. When one visits Tai Mountain, the important etiquette is to visit Taishan Mountain temple’s corner temple. This has a meaning of regarding the place with a defending noble character, bravely defending the mountain and river. This Tai Mountain temple’s surrounding wall built Corner Towers, was designed based on 八卦 Eight Diagrams directions.